This is the oldest Ashkenazi Synagogue in the English speaking world, a plain dignified, grade one listed building. Inside are many exceptional features including a Barroc Ark and, it has to be experienced to be appreciated, a remarkable ambiance particularly during services. Thanks to the voluntary contributions and dedication of many this gem of Plymouth’s and Jewish history is today in good condition. The kosher vestry is available for visiting Rabbi’s and their families, the vestry reception has two examples of The Israel Collection, paintings by Gordon Frickers. 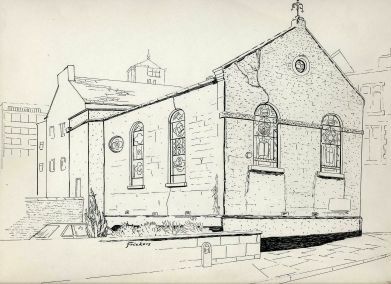 This unique drawing was made in happier times, before the rare stained glass windows had to be fitted with bullet proof panels and iron gates fitted to the side alley because of rising antisemitism in Britain. See also Gordon Frickers Landscapes in Israel paintings.